Backing up is a bit like flossing: everyone who wants to keep their teeth should do it, and a great many do not. No, that’s a bad analogy. Backing up is like planning fire escape routes: the more you have, the safer you are. Wait, no…hang on. I’ve got it. Backing up is like strapping a monkey into a rocket and blasting it into space. It totally is. Trust me on this. I backed Space Monkey on Kickstarter because it sounded exactly like a thing that everyone needs: a local backup, an offsite backup, a Dropbox account, and an iOS photo backup service, all rolled up in a single device. Well, a few days ago I received mine. So unfold that chair, focus those binoculars, and get ready to watch the launch, because it’s blog post time. The Space Monkey is an attractively designed, pod-shaped data storage device. On the back are three ports: power, ethernet, and USB. The USB is intended for diagnostic purposes only, and does not work for data transfer. The only way to communicate with the device is by plugging it into your router. There is no wifi, which is fine. Wired is faster, and I wouldn’t want a device like the Space Monkey, which is pretty much always using the network, clogging up my wireless. There is no fan, and the hard drive inside is very quiet. In a quiet room, I could only hear it by listening closely from 3 feet away. After 40 hours of continuous data transfer, the Space Monkey is only slightly warm to the touch. A set of three colored LEDs indicate device status. The pattern that indicates a normal, happy state is for the blue LED to pulse on and off about once a second. That’s right: it never. stops. BLINKING. I had to put it in a place that’s out of my field of vision while working at my computer. If I hadn’t, the blinking would have driven me insane. That’s my least favorite thing about the design. My favorite thing? The ventilation holes in the sides are drilled in a pattern that’s highly suggestive of a rocket ship. Everyone already has a local backup. Right? (right?) Of course they do. (ahem) So, the local backup aspect of the Space Monkey is not terribly exciting. And actually, the Space Monkey, in its current form, is catastrophically bad at providing a local backup. To explain why, I must first explain how the client software works. As a Mac user, I can speak only about the Mac client. There is also a Windows client, and, as of this writing, the Linux client is still in development. 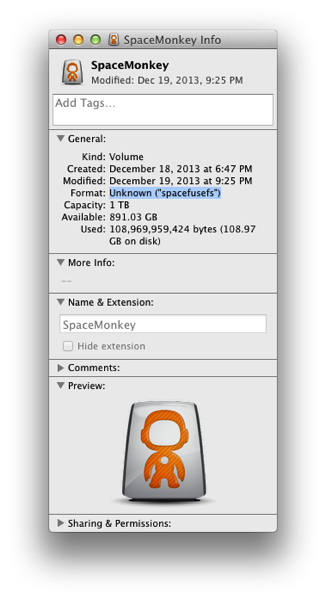 The Space Monkey client mounts the device in the Finder using a user-space filesystem called spacefusefs. Its mount point is your home folder, not the system-wide standard /Volumes, so that’s where it shows up, complete with an eject icon next to its name. As it is a mounted volume, it also shows up in all the other places mounted volumes can inhabit. When you drag a file into the spacefusefs mount, the client software copies the file into its cache under ~/Library/Application Support. It then makes its leisurely way onto the device. This approach has a lot of advantages, but it’s not so great when you want to copy over a huge amount of data, especially if that data is larger than the amount of free space on your boot drive. So, there is another way to move data onto the Space Monkey: you can right-click on any item in the Finder and select “Copy to Space Monkey”. This approach shoots the data straight over, bypassing the cache. The cache is used in other ways as well. As you browse through your files on the device, the client preemptively copies any files (but not folders) you highlight into the local cache. It appears as though it keeps copying even if you close the Finder window without opening the file. Second, the device is slow. But I’ll come back to that, because it deserves its own section. So, how are you supposed to use the Space Monkey as a local backup? Most backup utilities would run afoul of the cache. SuperDuper, for example, doesn’t recognize the spacefusefs mount as a backup destination. Time Machine support is planned, but not currently present. The best solution I could think of is to copy my home folder using the direct copy functionality, then keep it up to date with rsync, as an incremental update is more cache-friendly. There may be tools to help with that. If you’re reading this and know of one, I’d love to hear about it. As I write this, my MacBook Pro has been copying my home folder to the Space Monkey for ~42 hours. In that time, its managed to copy 109 GB of data. That’s an average rate of 5.8 Mbps. I’ve seen peak rates at 25.6 Mbps, but they never last long. There’s no way around this: copying my 500GB home folder is going to take the better part of a week. Ouch. …you cannot compare to a simple NAS transfer; we hope to reach that one day, but uploading to the SM device is not as simple as a straight upload. Your NAS does not need to encrypt your files, break them up into pieces, and push them out to random users on a network and be able to get them back at a moment’s notice. In addition to the encryption and chunking she mentioned, the Space Monkey also does internal compression and deduplication. I presume these features are implemented in software rather than with custom silicone, so the transfer speed of the device is limited by the efficiency of that software and by the speed of the processor that runs it. This is never more apparent than when the client is uploading a large number of small files. During such times, it doesn’t look like much of anything is happening at all. Space Monkey is spinning this in comparison to throttled online backup solutions. All well and good, but I was promised local copy speeds, and honey, this ain’t it. That being said, I am cognizant of the fact that I am a very early adopter of this device. Space Monkey has said that it’s working on the problem, and I’m reasonably confident they can manage it. The problems this small startup has solved to put this device together are massive, and I have high hopes that they will be able to sort out the performance issues in time. The main attraction of the Space Monkey is that it is part of a “storage network”. 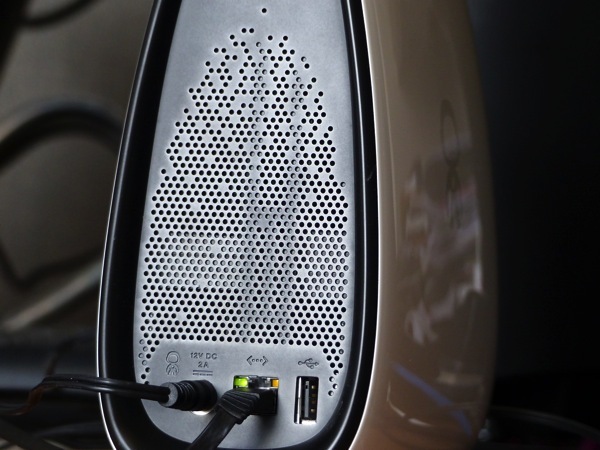 The hard drive inside of the pod, of which you are allowed to use 1TB, is actually 3TB in size. The extra space is used to store other people’s chunked and encrypted data. In return, your data gets chunked, encrypted, and redundantly stored on other people’s devices. The promise is that, should your device fail, or your house burns down, or floods, or gets hit by a drunk driver (which can happen), your data is still out there, still recoverable. Space Monkey says that they monitor the health of your data in order to ensure that, even if some devices that had been storing your stuff drop off the grid, your data remains safe, redundant, and recoverable. This means that you can expect your Space Monkey to utilize your Internet connection, up and down, pretty much continuously. Users of bandwidth-capped connections beware. The client allows you to cap the transfer rates, and the defaults (100 Mbps down / 0.668 Mbps up) seem sensible. The upload may be a little low. We are talking about a lot of data here, and while the Space Monkey is autonomous, I’d still rather not wait months for my data to hit the network. Is this distributed approach better than a dedicated cloud backup service? Yes and no. On the plus side, it’s greener. Data centers need a lot of electricity, both to run and for cooling. It’s also fault tolerant, in that there is no data center to, for example, get hit by a hurricane (which happened to the company I work for. Thanks, Irene). On the downside, getting your data back out, you are subject to the upload caps of your peers. Maybe they’ll be able to get a bit torrent-like swarm going and give you great performance. I don’t know, and I hope I never need to find out. Space Monkey gives you access to your files, Dropbox-style, through a web interface and iOS/Android apps. I don’t know if the desktop client works if your computer is not on the same subnet as your device, since I haven’t tested it, but both web and iOS work from anywhere. Using either of these interfaces, you can upload, download, and delete files and folders. You can also generate download links to any file you wish, which you can use to share files with others. The Dropbox inspiration for these features is plain. If you have a Dropbox, you will know how nice this is. I don’t have much more to say about this, except that it works, almost miraculously so. As soon as your files are on your Space Monkey, you can get at them from anywhere, though performance isn’t great (due, I am sure, largely to the upload cap). Because I listen to the Accidental Tech Podcast, I learned about Everpix just in time for it to go out of business. The crew spent quite a lot of time lamenting that loss, and wondering if anyone would ever be able to back up all of their photos from their phones. Well, Space Monkey does. The Space Monkey iOS app can automatically upload every photo and video you take with your iPhone to your Space Monkey. It even works while the app is running in the background. It does not, however, use the iOS 7 periodic wakeup functionality, so it does have to be running for the uploads to take place. Again, there is little more to say about this, except that it works. After I enabled the feature, the app went to work, and soon all my photos and videos were on my Space Monkey. When I took more photos, the app noticed, and promptly uploaded them. Performance is pretty good, too; after all, the Space Monkey’s download cap is quite high by default. This was a surprise killer feature that I didn’t know about until I fired up the iOS app, and I think it will end up being the one that I use the most. There have been several changes to the pricing structure, so you may find conflicting information out there. As of this writing, it’s pretty simple: Pay $200 for the Space Monkey device, and you get a year of service free. Thereafter, you’ll have to pay $50/year to keep using your Space Monkey. As for availability, they are currently rolling out to their kickstarter backers, who get first dibs. But, right now they have some extra units that were supposed to go to international backers but did not meet international CE regulations. So, right at this moment, if you go to spacemonkey.com, you can buy a device, but there’s no telling how long that stock will last. In its current state, there is a lot to love about the Space Monkey – and a lot that has disappointed me, too. This is a device produced by a startup (investor-funded, but still on a tight budget), and it’s a very early version, so of course it’s not all honey and roses. Furthermore, there’s a nagging doubt in the back of my mind that Space Monkey may never reach mainstream acceptance. Nerds like me immediately recognize the value, and potential, of this device, but it’s hard to explain to ordinary people. Have you ever tried to explain to a non-computer nerd how Dropbox works, much less convince them that they need it? Yeah. Explaining the Space Monkey is much the same. Warts and doubts aside, I am nevertheless astonished that this device exists. They’ve strapped their monkey into a rocket and shot him into space – low earth orbit, but still space. They won’t stop there. They’re aiming for the moon, and I think they can make it. If they don’t run out of money, and enough people believe in them enough to buy in, they will surely make it. “Thanks for believing”. It’s a phrase we kickstarter backers have heard several times. Well, Space Monkey, I believe. Please, don’t prove me wrong.